Dynamic filters are applicable for Product Based Recommendations, Cart Based Recommendations and for Best Sellers. 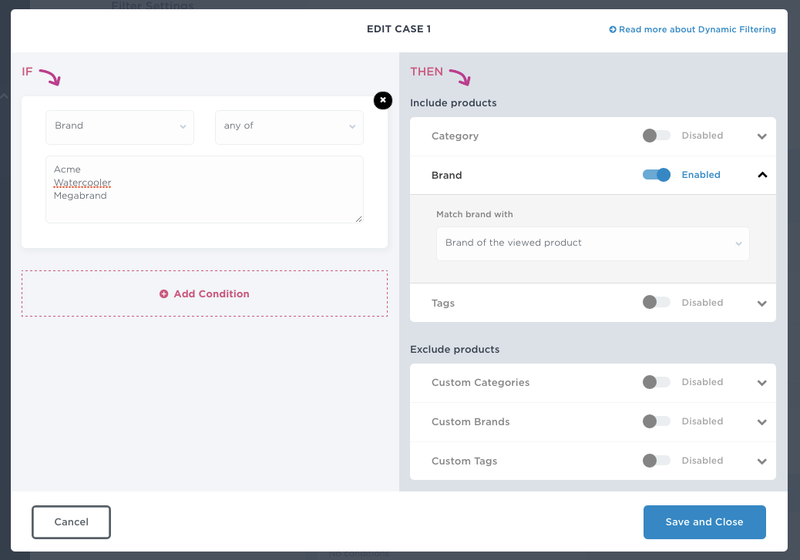 The context is based on viewed product on product based recommendations, all products held in cart on cart based recommendations and on viewed category for Best Sellers. Enable the feature by selecting advanced dynamic filtering, which reveals available options. You may apply rulesets strictly by selecting “Show only filtered results”, but this setting might leave the recommendation empty if not enough relationship data has been acquired and processed. 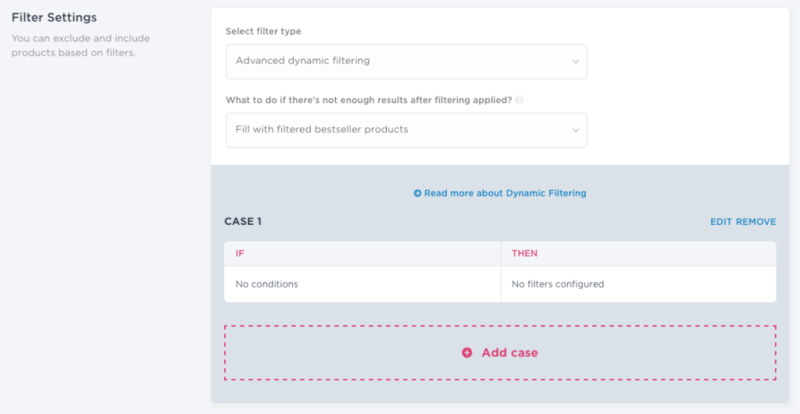 Therefore we advise to use “Fill with filtered bestsellers”, which will still apply given filter settings strictly, but will include best sellers based on the conditions if the viewed product doesn’t have behaviorial relation to other products based on filter settings. 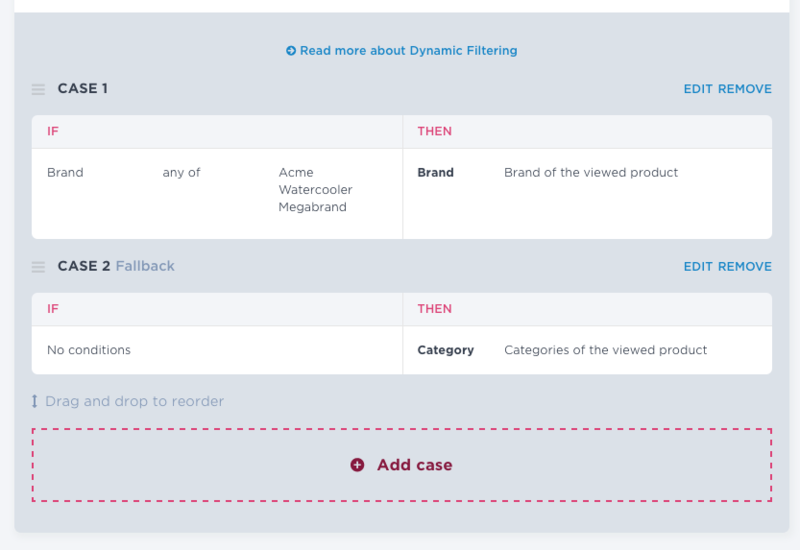 “Fill with unfiltered” option will fall-back to products across all ranges, but by keeping filtered products prioritised in the recommendation. It’s advisable to use this option only if you have one cross-seller recommendation on a product page as otherwise there might be overlapping products in the recommendation. 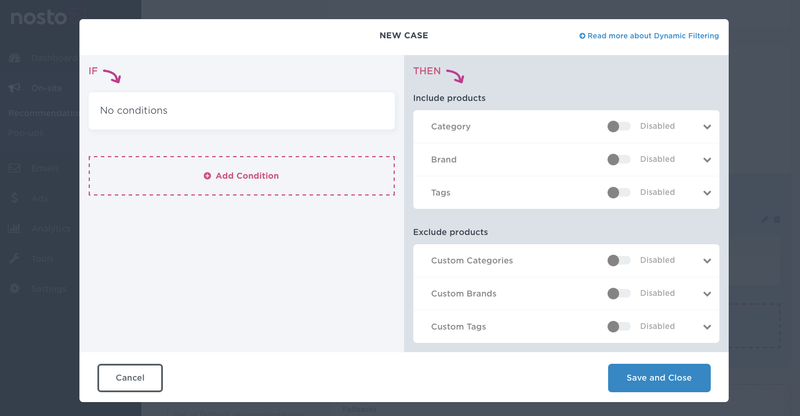 Start by adding a case, which will reveal filter options and proceed by adding a condition clicking add case. 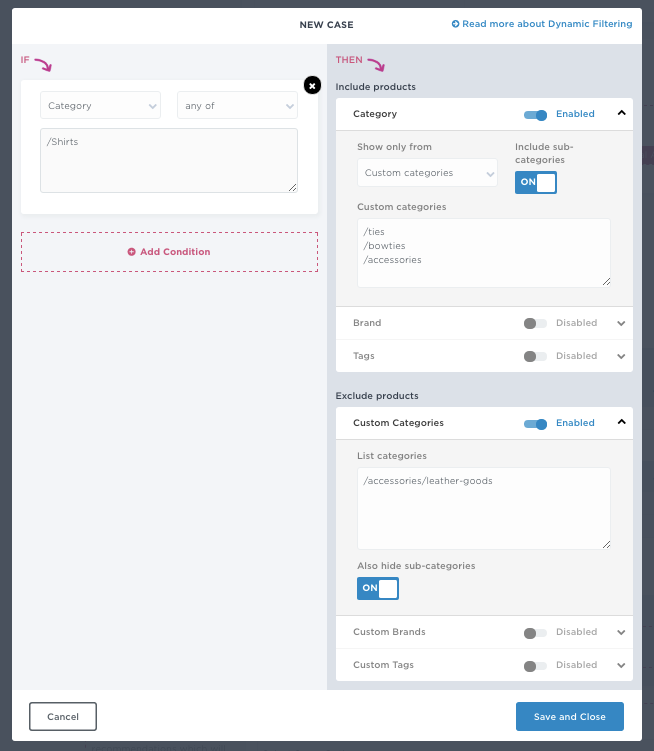 The most common option is to do recommendation pairing based on product categories. 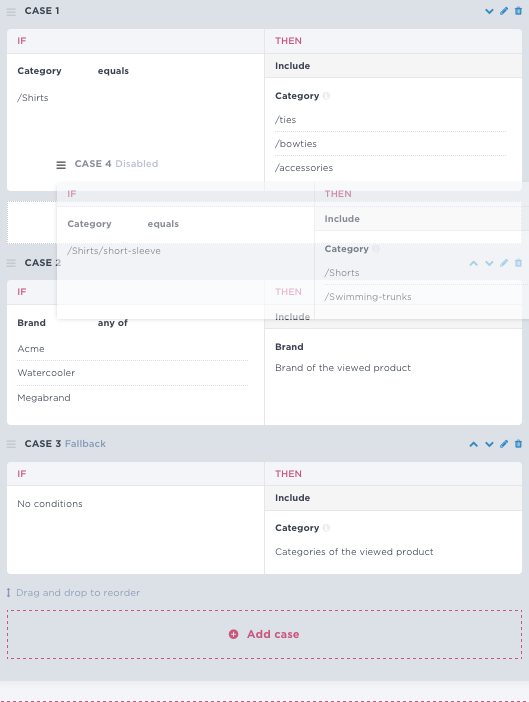 As an elaborative and practical example, if a customer is viewing product in shirts-category, dynamic filtering allows narrowing down cross-sellers to most relevant options in a specific and pre-defined product category such as ties whereas regular filtering might recommend ties but also other relevant supplementary products across all product ranges. Adding conditions will effectively override what recommendation engine considers as the most relevant product recommendations by applying your filter settings explicitly. 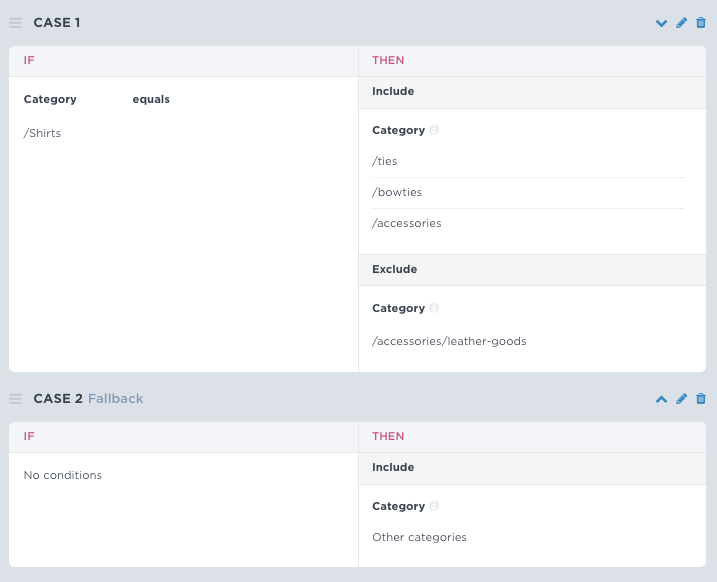 In the example below, when a product viewed belongs to category /Shirts the recommendation will feature products only from categories ties, bowties and accessories. Note that your category-tag format most likely differs from the example so use debugger to reveal the exact format and wanted categories in the text-area one per line. In the example above, you might want to exclude leather accessories for business reason. Assuming this is the only specific case we would like to apply, the last rule should be the fallback to regular filtering. Developers might understand this as the else outcome. Fallback is configured by leaving the condition empty and selecting the preferred behaviour, in the example “Show only from other categories” as the case #2 working as a fallback. 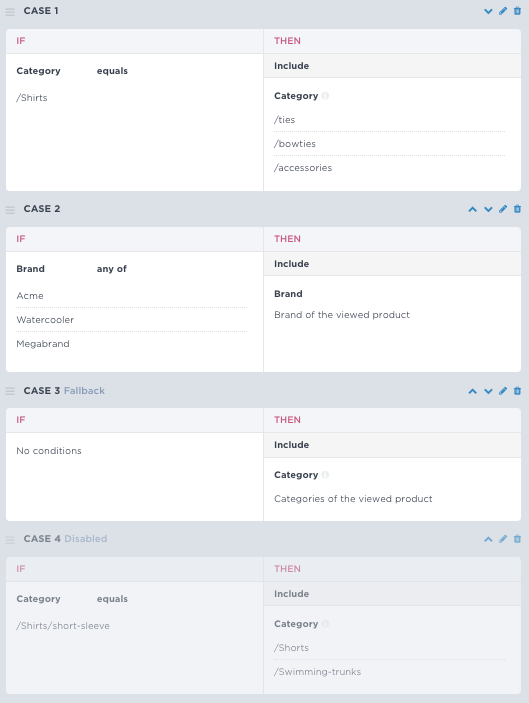 If viewed product is shirt, recommended products are ties, bowties or accessories (case #1) but not leather accessories , but when viewing a product from any other product category than shirts, recommended products are supplementary products from all other categories except from the viewed one (case #2). 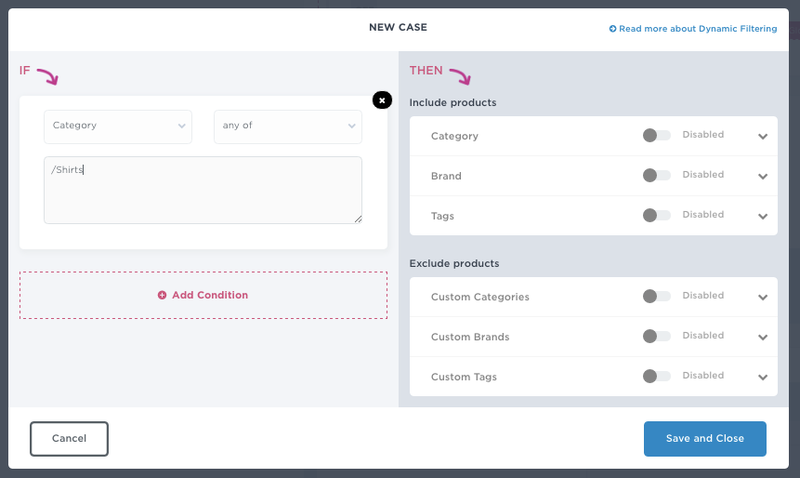 Now we understand how the conditions and fallback rules are added and how to set rules based on categories so let’s have a look at another common use-case where dynamic filtering becomes handy: Brand-exclusion. 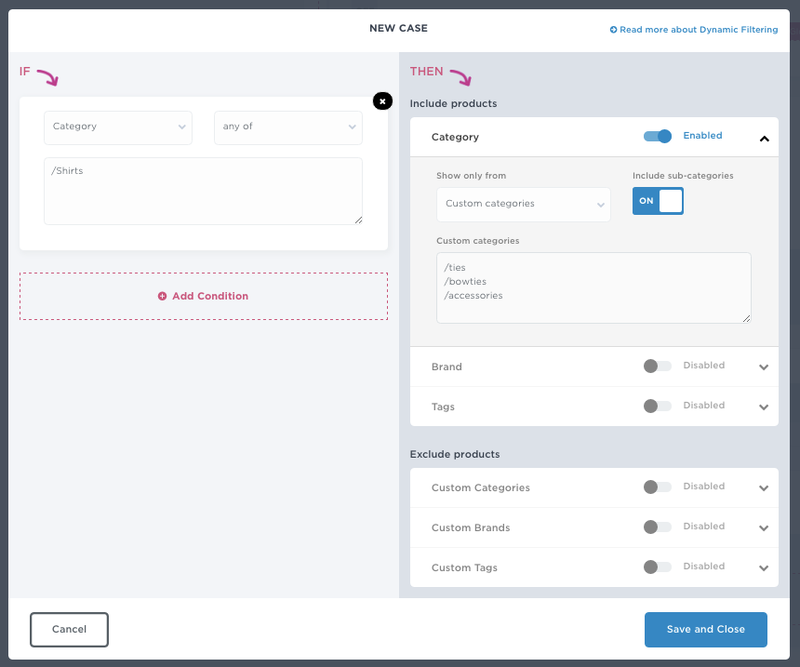 If a certain brand doesn’t allow cross-selling of other brands on product detail pages, dynamic filtering can narrow cross-sellers only to the same brand in cases when cross-selling is not allowed, but by cross-selling also other brands when cross-selling is not limited. Configuration below would recommend products from brands Acme, Watercooler and Megabrand (case #1) when viewing any product from these brands, but when viewing any other brand, the recommendation would fall-back to case #2 and recommend relevant alternatives from other categories as the brand-exclusion rule doesn’t apply. Simultaneously, note that excluding rules are also supported. Rule regression and order is an imperative importance when multiple conditions as cases are applied, which also allows sophisticated use-cases of dynamic filters. Cases are read from top to bottom or from first to last, meaning the last one should always be the fallback, whereas the first one should always be the most explicit rule you want to apply. If a dynamic filter setting doesn’t yield an expected result, it’s likely that another rule is applied before the desired one. Let’s have a look at this by using an example where we combine all of the learnings we’ve had so far. When created, a new case and rule is always added to the bottom. Assuming that there is a sub-category of shirts /Shirts/short-sleeve, which are something for the summer and with these shirts preferable cross-sellers would be shorts and swimming trunks, a re-ordering of cases is needed. Re-ordering the cases solves the issue. Drag and drop cases to get the preferred output and end-result. 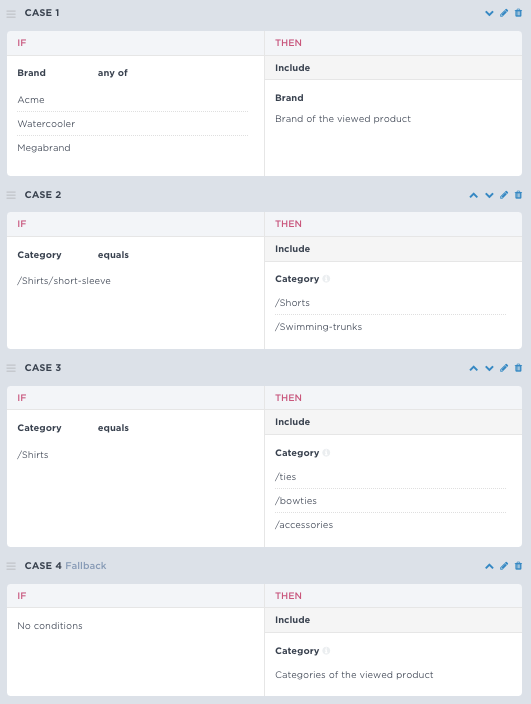 The configuration like below looks much better and yields expected results for categories, but let’s review how the cases now adjust the recommendation. 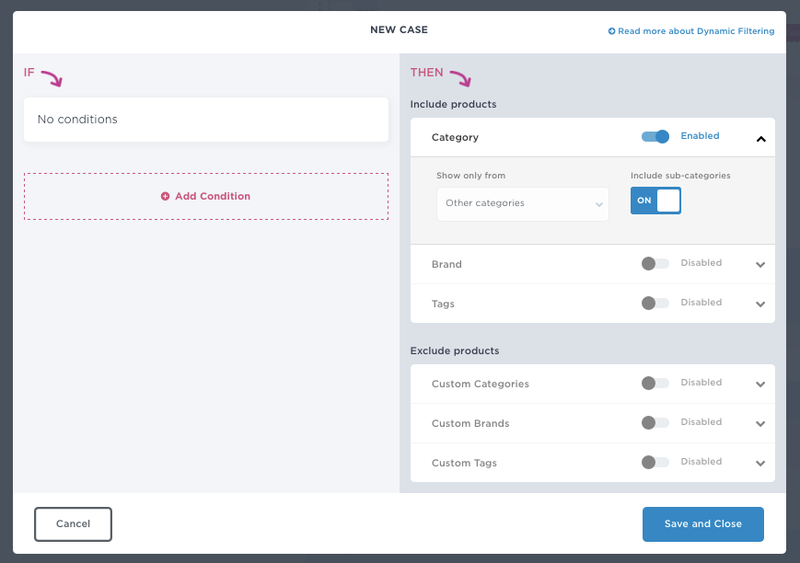 Case 1 adds the important brand-exclusion rule, which we need to apply in the example throughout all categories so it should be applied first. Case 2 is explicit or more specific one than case 3 so it should go first. By having cases in this order, shorts and swimming trunks are always recommended when customers view short-sleeved shirts, but when a product is any other type of a shirt – ties, bowties and accessories are recommended instead. If none of the rules match, case 4 kicks in as a fallback and recommends products from other categories, in practice producing a recommendation which features supplementary products like “Shop the look” in fashion. 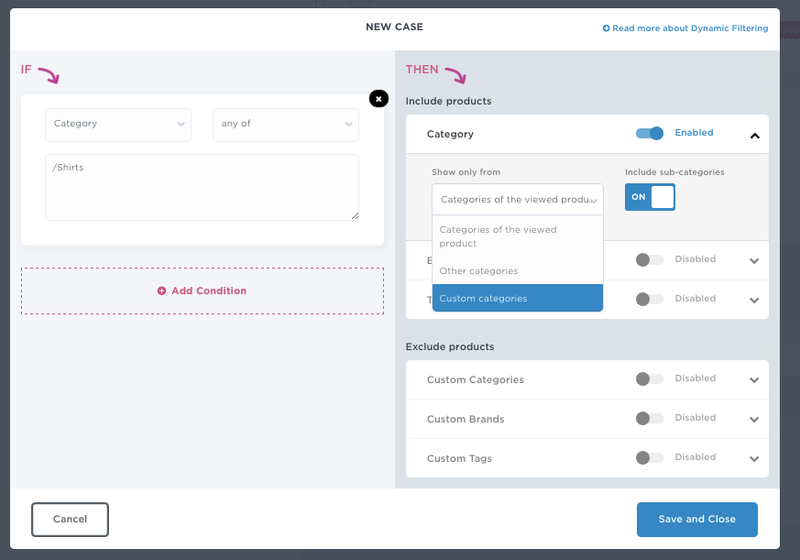 Multiple conditions enable support for use cases when particularly specific recommendations are needed. Conditions are inclusive meaning all conditions need to be matched in order the recommendation to yield preferred outcome. An example again describes functionality best. 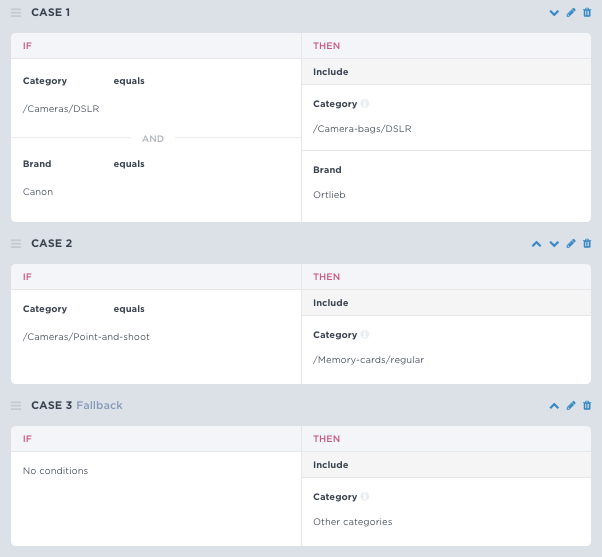 Based on case #1 if a product is a DSLR camera from Canon, recommendation features suitable camera bags by Ortlieb, narrowing down recommendations to a very specific subset of products. Case #2 recommends regular memory cards with point and shoot cameras. Last but not least, note again case #3: Fallback-rule recommending products from other categories.